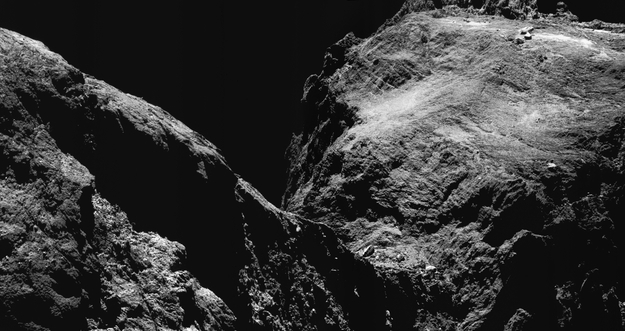 A mosaic image of Comet 67P/Churyumov-Gerasimenko taken on 15 May 2016 with the navigation camera (NavCam) on board ESA's Rosetta mission. Part of the small comet lobe is visible on the right and a portion of the large lobe on the left. The mosaic is composed of two images taken when Rosetta was about 9.9 km from the comet centre (about 7.9 km from the surface); the average scale at the surface is about 0.8 m/pixel and the region shown measures about 1.5 km across. These observations were performed in a three-week period during which Rosetta flew very close – 5 km to 8 km from the surface – so that ROSINA, the Rosetta Orbiter Spectrometer for Ion and Neutral Analysis, could search for the noble gas xenon, an important tracer of the early Solar System's composition. This challenging operation was necessary to obtain a significant detection of several isotopes of xenon. As a result of the observations, ROSINA identified seven xenon isotopes, as well as several isotopes of another noble gas, krypton. The individual NavCam images are available here: left image and right image. Rotation and translation of the comet between the two images make it difficult to create an accurate mosaic, and there may be some spurious features as a result of the mosaic-making sequence, so always refer to the individual frames before performing any detailed comparison. The faint vertical striping effect is an image artifact. This work is licensed under a Creative Commons Attribution-ShareAlike 3.0 IGO License.